I’m beginning to suspect that this blog is mostly going to turn into a list of the famous people I become obsessed with throughout my life. A pathetic and hyperbolic record of the varying degrees of love I have for different actors and actresses. Unfortunately, this post isn’t going to be my first step towards turning over a leaf as I am about to open with the following statement: I love Rebel Wilson. I know. I know. Who doesn’t love Rebel Wilson? She’s incredibly funny and is consistently guilty of stealing every scene she’s in. Like her fellow Bridesmaidsstar Melissa McCarthy, Wilson has often been cast in the type of roles that would solely rely on her size to gain cheap laughs but she has continued to show signs that there is a great deal more to get from her. It is down to Wilson alone that I had any desire to see this loud and shiny assault on my senses. Although to be quite honest, when it comes to moments of group singing and dance numbers I can’t help but get drawn into the moment. I love them. I’m willing to put up with even the shittest of films thanks to those precious moments of highly choreographed and rehearsed moments of spontaneous musical outbursts. Hell, I didn’t hate Blues Brothers 2000as much as it deserves thanks to the sight of Dan Aykroyd, John Goodman and that kid dancing together whilst Aretha Franklin belted out ‘Respect’. This said, I’m not a fan of Glee. I know it doesn’t make sense but there’s something about those smug 30 year olds pretending to be teenagers that just riles me. Glee takes the fun out of musicals and takes itself far too seriously. Especially considering it’s nothing more than a load of whiny school kids singing classic rock to each other. It’s like Dawson’s Creekpretending it’s Casablanca or something. Plus, why the hell is the fat one called the best singer of the group whilst being the only person who always needs to rely on auto-tuning to reach the high notes she’s entrusted with? Hmm? Anyway, Pitch Perfecttakes us into the seedy underbelly of collegiate a capella competition and tells the touching underdog story that Hollywood was crying out for. 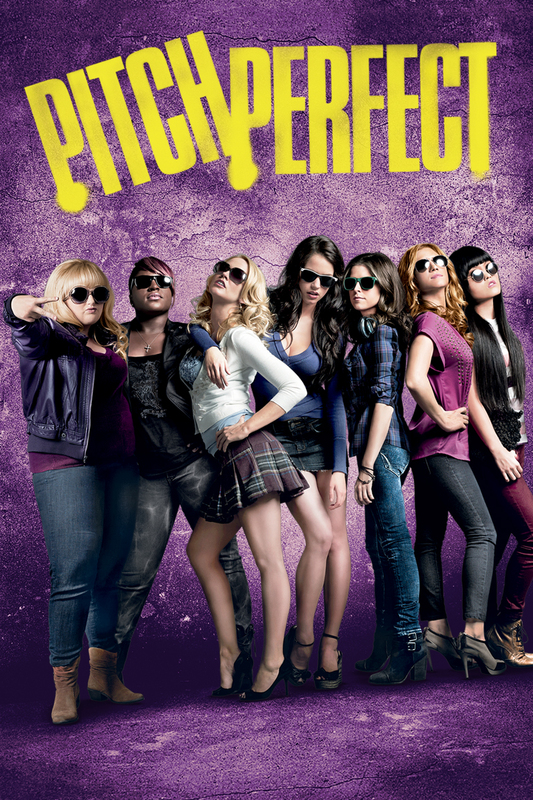 Namely the journey undertaken by all-girl a capella group, the Barden Bellas, to save their reputation whilst bringing down their bitter rivals, the Treblemakers. Pitch Perfectisn’t exactly breaking new ground here and the narrative structure is pretty obvious from the outset. However, the slick writing and absurd characters ensure that it is far from pedestrian. Feeling less like High-School Musical: The College Yearsand more like a musical version of Mean Girls. Penned by one-time 30 Rock writer Kay Cannon it’s no wonder that we are well catered for in terms of catty humour and ridiculous scenarios. The crux of the comedy comes in the form of Rebel Wilson’s Tasmanian diva Fat Amy (don’t worry the comedy is more sophisticated than the name suggests) and Hana Mae Lee’s whispering but deranged Lilly. Wilson is the queen of ad-libbing and she shamelessly steals every scene away from her fellow stars. She is always a delight to watch and, as Fat Amy, she gets the chance to be as outrageous and over-the-top as possible. If is wasn’t for the utterly unbelievable actions of Lilly she would stand-out as the one character to lift this out of the mainstream. Add to that Elizabeth Banks and John Michael Higgins’ link with the likes of Dodgeballand Best In Showthanks to their cutting commentators and we have stand-out moments of pure comedy. Whilst not as noteworthy, the rest of the cast are anything but the usual stock characters we see in so many of these films. We have great supporting roles from both Anna Camp and Brittany Snow and a slightly higher class of rom-com leads courtesy of Anna Kendrick and Skylar Astin (even if they do sit within the slightly ridiculous Hollywood view of what it is to be alternative). Kendrick has found her market playing the edgy outsider who despairs of the people around her. Beca finds herself stuck at Barden due to her father’s wishes whilst she dreams of running off to LA to pursue her DJ career. She’s not the most obvious new Bella but, as the audience will quickly pick up, she is the one they need to reinvigorate themselves. She makes quite an impression on Astin’s Jesse who, showing the apparently necessary appreciation of John Hughes movie and a misguided love of Simple Minds, plans on being a composer of film music. Romeo and Juliet they are not but there is something sweet about their flourishing romance. My major issue with Pitch Perfectis the unmistakable sense that much of the original narrative was cut out to shave down the run time. We are introduced to interesting plot points that are quickly forgotten about before anything can really come from them. The hint of a love-triangle between Beca, Jesse and their radio station boss is sent into oblivion after a few moments of pouting jealousy on Jesse’s part. The relationship between Beca and her father is never really allowed to gain much ground and a brief discussion concerning his divorce from her mother is all we get of any real attempt at emotional reconnection between the pair. Whilst this doesn’t really take a great deal away from the film it does make it feel slightly sloppier than the script and the performances deserved. Well the part of the script that doesn’t rely too heavily on projectile vomiting anyway. I didn’t want to like Pitch Perfect, I really didn’t. There was nothing I wanted to sit down and watch less than Gleemeets Bring It On. Although, after watching it and listening to the soundtrack non-stop for a couple of weeks I can’t deny that it’s certainly worth a watch. Pitch Perfect doesn’t rely too heavily on the ‘getting actors to sing pop mash-ups’ gimmick and if anything, the music is an after thought in the whole plot. That’s not to say it’s not good (as the number of plays on my Spotify can confirm) but it is an add-on to a compelling and entertaining film. The potentially unnecessary but slick icing on a well-structured, tasty but at times disturbing cake. By no means is it going to be a modern classic or the finest teen comedy you’ll ever see but it is arguably one of the slickest films in this genre you’ll have seen in the last few years. I can’t deny it my friends, I’ve been pitched slapped. ← Dr Who and the blog post of doom.